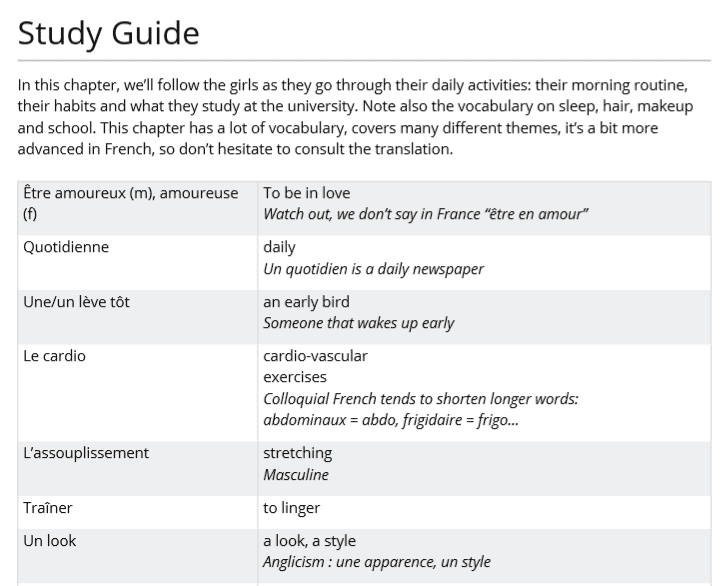 Summary: French Today offers audiobooks, skype lessons, and on-site lessons in France. This article will focus on the audiobooks which range from beginner to the upper-intermediate level. There are different types of audiobooks, all of which are quite extensive. Many of them have nearly 10 hours of content and a PDF file with 200 or so pages. Price: The audiobooks range from $20 to $70. There are also bundles that make things a bit cheaper. Francais Authentique has immersive lessons entrely taught in French. FrenchPod101 has audio lessons available for a low monthly subscription cost. Rocket French has well structured and interactive courses while Duolingo can provide a free introduction to learning French. French Today offers three main products – audiobooks, Skype lessons, and immersion homestays in France. The majority of this review will focus on the audiobooks with options available for beginners up to the upper intermediate level. For the purpose of this review, I tried out the Intermediate French Booster Pack. We’ll talk a lot more about what these entail and the different audiobooks available later in this review. The Skype lessons cost $58 for 55 minutes which is insanely expensive. I would recommend anyone interested in these kinds of lessons to go to italki where you’ll find a teacher for a fraction of the cost. Finally, the last feature of French Today, are their homestays. They’re also expensive with a minimum cost of $1178 but they also sound like a great experience. Unfortunately, I haven’t had the chance to go and try this out, so I can’t comment too much on whether or not it’s a good way to spend your money. There are several audiobooks available; each serving a different purpose and for a different level of fluency. They’re available for sale individually and in bundles. Purchasing as a bundle can provide pretty big savings. First, you have the Beginner and Intermediate French Learning Audio Method. These tell us the story of the protagonist in different situations in the form of dialogs. It gives you a real feel of how one should speak French in their daily lives and lets us learn as we listen. These are quite extensive – a typical book contains over 8 hours of audio and a 180+ page PDF. There are six different levels here which progress in difficulty. Then you also have a few different Verb Drills books. While I didn’t have the chance to try these out, you can listen to a sample on their webpage. The content for these can vary pretty significantly. Each of the Verb Drills books contain over 10 hours of content and a 200+ page PDF. Additionally, there are two intermediate level Audio Novels. These stories follow a couple as they go on a trip. Again, the amount of content is quite impressive, with over 5.5 hours of audio, recorded at different speeds, and a 150+ page PDF. Finally, there are subject-specific French books. These cover a variety of different topics, such as pronunciation, adjectives, greetings, poetry, and more. The amount of content in each of these books varies, for example, the poetry book includes over 9 hours of audio, whereas the one focused on greetings is about an hour long. To get started with French Today, all you need to do is create an account. 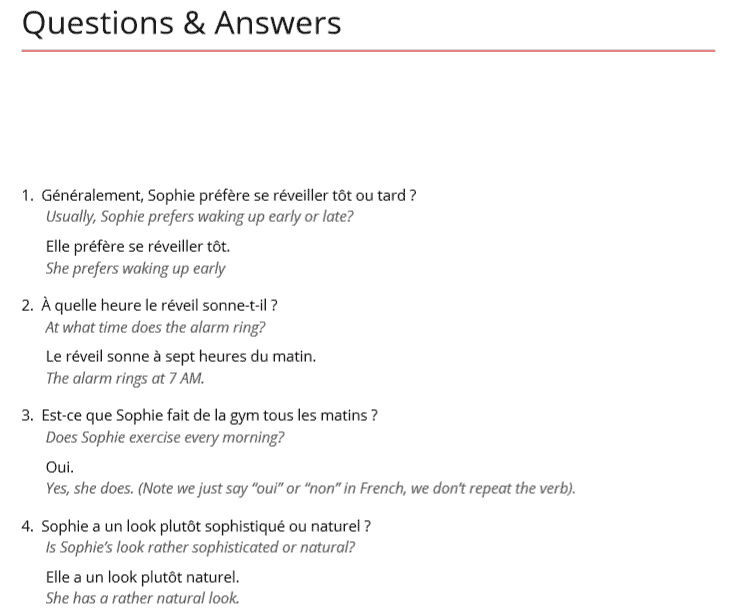 You will be able to see two options at the top – “French Audiobooks” and “French Immersion”. Under audiobooks, you can either select one or go to “all” to view all the available options. Once you buy the audiobooks, you can view them in the “My Account” tab under “Download Audiobooks”. The download comes in the format of a zip file, so as soon as you extract all the files, you can start learning. Additionally, if you download their app, you’ll receive two free audiobooks without needing to sign in. If you’ve purchased other audiobooks, these will show up and be available for download here. The French immersion options are a bit harder to choose. For Skype lessons, you have to write a message to the instructors requesting a session with them. For some reason, you could only book a session with two of the available six instructors. However, to make the payment, you will need a create a new account in the French Today Clients portal. Once you make the payment, discuss the timings of the call and what you would like to learn during the session, your lessons will begin. Again, I’d strongly discourage anyone from using French Today for tutoring as it’s extremely overpriced. Instead, go to italki where you’ll find teachers for much less money and scheduling that’s much more flexible. 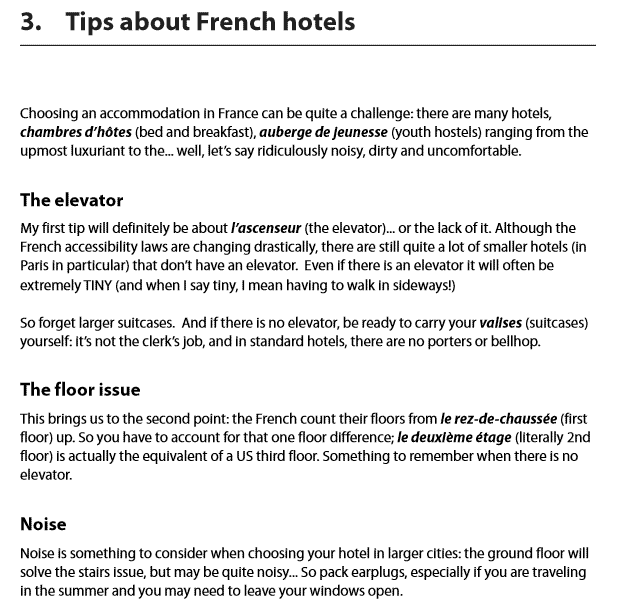 Finally, coming to the French immersion stays, these are an even more complicated thing to book. Not only do you have to select the instructor, but the instructor must select you as well. By visiting the page, you will get a list of all the people who conduct the course. You can get more details about them if you select their option. If you like one of the options, you must send a message through their portal requesting the lessons. You will also need to divulge details about who you will be traveling with, what you eat and many other things and then the instructor must approve. If money isn’t an issue, I can’t imagine a more enjoyable way to learn French. When it comes to the French immersion lessons, it depends on what the instructor has in mind for you and what you have requested. Since this varies a lot, I won’t be going into that. Instead, we will discuss the audiobooks and how they have been organized. If you use your computer, each audiobook is downloaded in the form of a zip file. Alternatively, downloading their app makes it convenient to study from your phone. The storyline series come with a PDF which has the transcript of all the audio files in both English and French. There are also a few exercises present in this booklet. Coming to the actual lessons, there are three different versions of the audiobooks there – the slow version, street version, and study guide. The PDF recommends that you practice the slow recordings along with the transcripts at first, then listen to the street version (normal speed) and finally look at the study guide after each chapter or recording. However, you can choose the order that suits you best. These story audiobooks are entirely in French which for some would be perfect and for others a bit intimidating. I personally like the fact that you’re completely immersed in the French language. 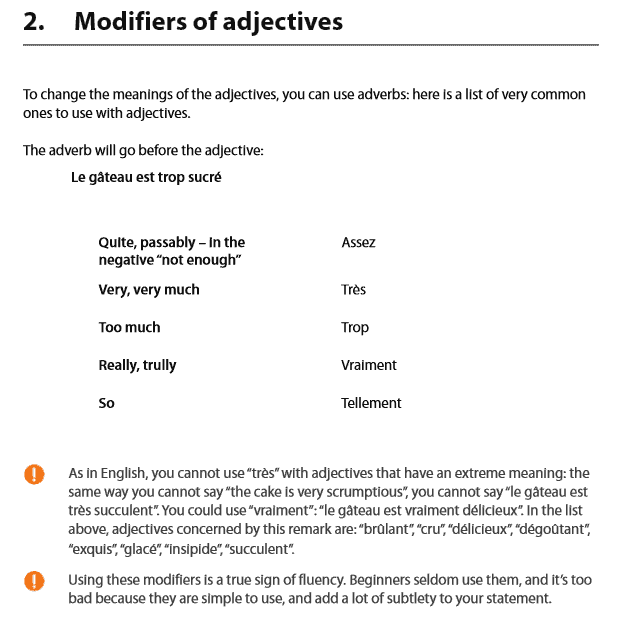 This is a nice contrast to other resources, like FrenchPod101, which uses too much English throughout the lessons. The story revolves around a girl and how she interacts in her daily life. The chapter begins with the narrator describing the situation. Then, the speakers take over and a dialog takes place between them. If you do find the fact that the audio is all in French to be a bit too challenging, you’ll be happy to see that the English translation is given in the transcript. However, even the slow speed is too fast for you to read both the English and the French versions at the same time, so you may end up with your finger hovering over the pause button. You might have to go through the slow audio books many times to get a grasp of the vocabulary as suggested by the creators. Then you can move on to the street version to see if you can pick up everything in the narration and the dialogs now. After this is a repetition of the dialogs and the narration until the chapter ends five to ten minutes later. The French Today app works really nicely. It saves your place as you read, you can choose whether or not you want to see the translations, change the font size, and more. After the chapter is over, you reach the study guide in the transcript which has a different audio file. The narrator speaks in English in the recordings during this period. The study guide generally contains some new vocabulary that was introduced in this chapter. It also has some tips on how to appropriately use these words. Finally, we arrive at the question and answer part of the chapter. It is essentially a comprehension test based on the material in the chapter. Sometimes, there are separate audio files for this, but otherwise, it is combined either combined with the study guide or the story recordings. You might have to go through the whole chapter once again to recall the details. The recording gives you some time to think of the answer and then moves on to the next question. Usually, it discusses the answers after a slight pause in the recordings. A limitation that I noticed in this system is that the answers concentrate on a specific phrasing which limits your understanding of the language. I would encourage you to come up with alternative ways to answer the questions and work with a tutor or language exchange partner. This dialog-based teaching will help you understand how to converse on a day to day basis. More importantly, these dialogs are usually based on real-life scenarios which you might encounter if you are living in France or visiting the country. Thus, you will get a good idea of how you can handle yourself in such situations. Some of the audiobooks might even have something called a grammar lexicon which is essentially basic grammar rules that you should know. Coming to the grammar-oriented audiobooks, they are rather minimalistic, and their contents vary widely from one book to the other. Some books do not come with the PDF transcripts while others do not have a slower version for the audio. In any case, the content supplied is more than enough to learn from. I had the pleasure of trying out the ‘Essential French Dialogs’ audiobook and the ‘Mastering French Adjectives’ audiobook. In any audiobook with dialogs, there will be a slower and a faster version that is completely in French. You will find the translation in the PDF file that comes along with it. In the ‘Essential French dialogs’ audiobook, there is a tips and tricks section with a separate recording for each. These recordings are mostly in English and thus you don’t need the transcript for it unless you are picky about some spelling. They are mostly about tourism and hence I would highly recommend it to anyone who is planning a vacation there. The mastering adjectives recordings, on the other hand, has just the one file for every chapter. The entire audio and the transcript was in English except for a few French words that were being discussed in them. Again, you can use the transcript to glance at the spelling of some confusing words that you hear. Due to the sheer number of option available, the prices of all the options vary quite a lot. Thus, I will give you a range of all the prices. All the beginner and intermediate audiobooks are priced at $70. The intermediate audio novels sell for $50. On the other hand, the subject-specific audiobooks can cost you anywhere from around $20 to $40. The verb drills are priced at $40 each. There is a bundle combining all three of the verb drills, but it costs basically the same. You can save quite a bit of money by purchasing the audiobooks in bundle form. A bundle of 2 books will go for $120 while 4 books cost $165. There appear to be frequent sales going on as well. So there’s a decent chance the price you end up paying will be lower than the ones quoted here. I would highly recommend going for the 4 book bundles as they give you the most value for money. The books have been paired perfectly for beginners and intermediate users. In the French Immersion section, you have two choices. The French Skype lessons which are priced at $58 for a 55-minute video call with one of the interviewers. Again, don’t waste your money on this. The price of the Immersion French Stays varies from one host to the other. They range from $1178 to $1885 for a week per person. In this, your stay, food, and lessons are included. You will have to arrange for transport though. You not only get to learn the language, but French culture, cooking, theatre, and many other things are included too during the course of your stay. While obviously, not everyone can afford this high cost, it sounds like an amazing trip. For both these options, you must message the instructors for their approval. There is no particular free trial available. However, you do have samples for all the audiobooks that they offer. These are available once you click the “Info” button at the store. The samples generally include 2 minutes of audio files of each type and a part of the original PDF. You can test the tracks out before paying for them. Additionally, you can download a free 2.5 hour audiobook. French Today also has a very lenient 100% money back guarantee anytime within the first 120 days of your purchase. As a whole, I think French Today is a good resource. However, it’s not perfect. There is a lack of proper exercises to test if you’ve actually mastered the material. You’ll also have to be a self-motivated learner to get the most out of the material. Unlike something like Duolingo, that has all the gamification and points you’ll need to push yourself to actually utilize French Today. That being said, French Today brings a lot of positives to the table too. The content has quite a lot of depth and because they are dialog based, you’ll find them to be extremely relevant to situations that you may find yourself in. Lessons made in this style can definitely help you improve your conversational skills but you’ll need to practice speaking elsewhere. A tool like Speechling can help fill the gaps. I also like the immersive feel to most of the audiobooks. It reminds me a little of Francais Authentique, though a bit more accessible to lower level students. The transcripts can act as a nice crutch here when you don’t quite understand everything. French Today also isn’t the right choice if you’re looking for a clearly structured course. Some suitable alternatives here could be Pimsleur, Lingodeer, or Rocket French. Finally, if you’re just looking for some audio lessons to supplement whatever other resources you’re learning with, FrenchPod101 could be a good alternative with a fairly low monthly subscription cost. Overall I came away quite impressed with French Today. If you’re not sure if it’s a good fit for you, I’d suggest trying out the free 2.5 hour audiobook.